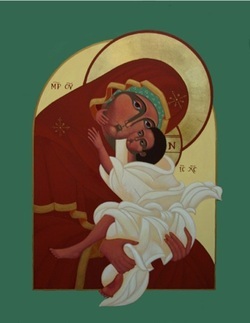 A Rosary is prayed at St. Mary's the first Tuesday of every month at 7:30 p.m.
Glykopfilousa ("Sweet-kissing") Mother of God icon, ©2005, Anne Pinkerton Davidson, Iconographer. http://www.outwardsigns.com Used with permission. Based on a Russian icon attributed to Theophanes the Greek, 14th Century. St Mary's Episcopal Church, 815 Lincoln Street, Cadillac, MI 49601.